That is how I get through that trauma now. However, I do not know for sure. Everyone seems to believe that the gun was not real but I did not know or could tell for sure. All I knew was that I couldn’t take any risk where I would be forced to find out even if I was 99% sure the gun was fake I still would not have risked otherwise as that 1% could have been the difference between someone losing their life over a small amount of cash. That is an obvious trigger of mine of which I can manage. Triggers are a scenarios the mind believes it is in which make the person believe the event or feeling of struggle whether it is traumatic, bereavement or compulsive (the list is not limited to these) is real once more and the body and mind goes into defence mode. Anyone can have a panic attack. Triggers can be totally unrelated to what you experienced or have mild connections to what actually happened. At the time, Tony Stark had his panic attack he was signing a picture drawn by a child of Iron Man flying and it then brought back imagery of him falling through the wormhole. The crayon breaking because of his muscles tensing and going into fight or flight mode. I know this is not the only example of mental health in the movies but one that came to me as I had seen it more recently and I was empathetic towards him. I know what along with many other people what it is like to suffer with PTSD. Even when the trauma is over triggers can come in many different forms. Even of those such as innocent as drawing with crayons or walking down the street and having someone behind you. The street is filled with people and are not all following you or intend to do harm if they are behind you. However, I face anxiety and moments of panic every time someone is walking behind me in the street. The only thing I can do is move to the side and let them pass and then I can calm down. This is still occurring 12 years after the initial trauma. Writing this now, I am even hesitating to move away from my desk where I feel safe, as I have reminded myself of this trigger. I cannot go to a club easily due to the amount of people around. If I do, I normally stick to the edge of the floor or by the bar. I can be made to feel completely anti-social because something that happened to me 12 twelve years ago cause my body to feel the aggression of the past in the present. In my book “A Past in the present through the Barrel of a Gun,” I talk about the positive and negative sides of a seesaw. 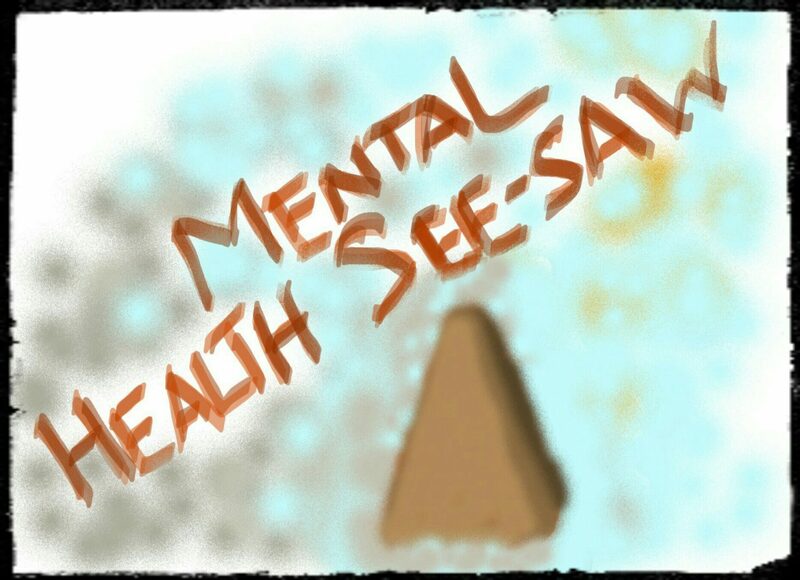 I see depression as an influence on a see saw. The see saw has to be balanced for the mind to be in harmony. A balance between the negative side (reactions to triggers) and the positive side (actions to numb the reactions). The environment the seesaw sits in is effectively the triggers. Social Media is an environment. You see things on social media like pictures of an ex, they stir up emotions from your past, and you may drink to nullify these emotions. Just one example of a trigger and its reaction. Next is an extract from my book on how triggers can affect you. “The Seesaw has two elements, the “Positive Side” and the “Negative Side”. But the environment the seesaw is in will play a big part in how the see-saw tips. From the initial trigger, further triggers can be added. Positive aspects to help you deal with these triggers can be determined by the environment also. Good or bad, short term or long term. For me the initial trigger of the armed robbery opened the first door. More and more doors opened afterwards which meant that more and more doors could also be locked. However if the door is locked again the key is still there to open the door once more. Doors open from both sides. Like the media, the stores lack of empathy played a big part in my journey. I felt forgotten, neglected and worth nothing. The day that was all confirmed to me was a very miserable Saturday in January. I had been shopping with my parents as I did most weekends. We were pulling down the drive and could see a bouquet of flowers drifting in the wind. When we picked them up, they were all but ruined from the weather. They were addressed to my mum, a small token ruined. Inside on the mat in the hallway was an envelope addressed to me. Inside was a card with forty pounds of vouchers to spend from the store. Forty pounds! I soon heard thoughts of “He could have been dead and all they gave him was forty pounds”. Anger filled the household. Anger filled our hearts and a sense of worthlessness had covered my surroundings. The environment I was in with the actions of others adding to my negative side. The environment cannot be controlled. It is outside of everyone’s control. So how do you cope with something that you cannot control? Control what will just add more and more weight to the negative side of the see-saw? You need to learn to love and respect yourself. “Pfft, look nothing bad happened in the end. Yes, it could have but it did not. We are only giving you this because of what you have done for us and we don’t want to look bad”. It may seem odd that a bunch of flowers, meant as a gift could create so much anger. Gift vouchers could create so much worthlessness. To be honest I do not know what could have been given to help. Nothing may have been better. Nevertheless, this triggered emotion that amounted to pressure on the negative side and made any progress my family and I had made obsolete. Triggering these emotions cause a response and if you do not know how to manage it then you do not know the best way to cope. Triggers push down on the negative side of the seesaw and your response on the positive side determines on long you will stay balanced. In the example of Tony Stark and his panic attacks, his response was to fix things. Make the world a better place. I like to keep myself busy and when I have experienced triggers, I hide and I focus on what I can until I feel strong enough to be exposed to the environment again. Although I have not always had such a positive response to the trigger. I have used drink as a means to forget my emotions and disrespected myself in order to bring some self-worth towards me but it doesn’t last long and these are negative responses on the positive side of the seesaw which bring you balance. These responses though will quickly drop as soon as they make you climb. Think of it as the “sugar-rush” you experienced as a child. You feel you can do anything, run around everywhere, climb anything but when it fades away. You are back at square one. Build up a positive response to these negative feelings. Playing on my Xbox helps me. It may not be the best thing to do but playing a game in a whole new world, getting a sense of achievement and being immersed in something of which I have control brings such warm and positive feelings to me and take away the negative thoughts I might have. They even sometimes make me feel good in that I can do much more. Manage them with positive responses.